Whether there is an identical or similar program available on both devices. Whether these programs access the same data files so that you don't have to worry about trying to reconcile different versions of your data. It is web-based. You access it through a web browser (such as Internet Explorer or Firefox). 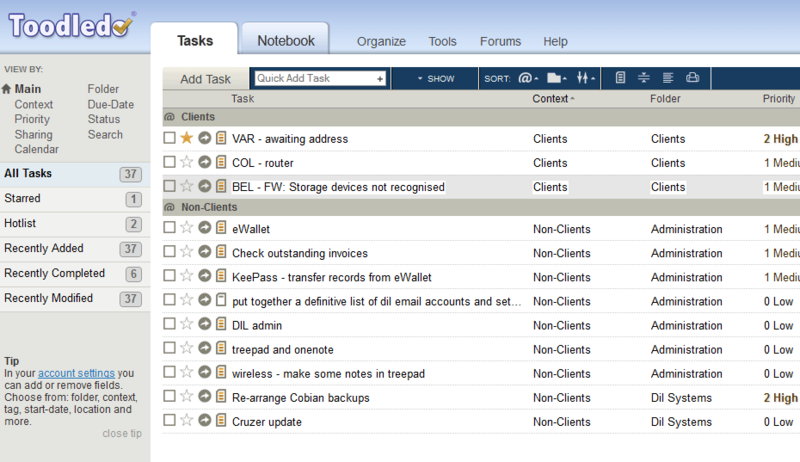 Your data (tasks, reminders etc) are held by ToodleDo on their servers. Consequently, your data is available from any computer that can access the internet. It could be a Windows PC, a Mac, a Tablet PC, a smartphone. You may need to have a working internet connection to be able to access your data (but some programs allow downloading of your data onto your own computer so as to make it available "offline" - ie available even when there is no internet connection). You may be concerned about the privacy and security of your data as it's online ("in the cloud") and outside your own control. Web-based programs are often slower, have fewer features, and are generally less pleasant to use than the equivalent "local" program would be. It's free (there's a "Pro" version available that has an annual subscription fee). There are lots of ways of classifying, sorting, and prioritising tasks. You can receive a daily email listing the most important tasks for the day. You can create tasks/reminders just by sending an email to a special email address linked to your account. This is useful for creating tasks as soon as you think of them, but it also means you can forward an incoming email to this special address so that it's on your "to do" list. There's a data backup/restore feature (but not, as far as I know, a method for working "offline"). Automatic Updates for Internet Explorer Have You Tried Re-booting It? Since I bought my Sony Tablet S I’ve been trying to consolidate all the different bits of software I use so that as much as possible is available on both my main Windows 7 laptop and on the Android tablet. “Android“, by the way, is the operating system on the Tablet. In other words, it does the job that Windows does on most computers. It was specially designed for mobile devices such as smartphones and tablet PCs where the screen is typically much smaller than that on a PC and where there is likely to be no physical keyboard. Whether these programs access the same data files so that you don’t have to worry about trying to reconcile different versions of your data. As I said in my earlier blog on Tablet PCs, I am new to Android and I’m pleased and surprised at how good it is with these considerations. I haven’t got it all sorted out yet and some requirements are easier to satisfy than others, but so far I am encouraged and I think it is very possible for users with the typical needs and skills of my own computer support clients to get value from a smart mobile device. Some people may need some help to get started, but once things are set up they seem stable and user-friendly (Android devices, that is, not my computer clients – whose stability and user-friendliness is beyond doubt). So, as part of that quest to get my main work needs met on a Tablet PC I went looking for a modern “Task Manager” (or “To-Do-List Manager”) that I could access from a Windows PC or Android Tablet. This “model” or “arrangement” of working through a web browser is becoming more and more popular. You’ve probably heard the term “Cloud Computing” and this is it. You don’t install a program onto your own computer, you don’t have to back up your data (if you trust whoever is hosting your data to do it properly), and you don’t have to copy or reconcile different data files between different devices. It’s not really new, of course: web-based email programs such as Hotmail have worked this way for years. But it’s now becoming more and more popular for other types of programs and one of the reasons for the growing popularity is this need to have the same data available on lots of different devices. You may need to have a working internet connection to be able to access your data (but some programs allow downloading of your data onto your own computer so as to make it available “offline” – ie available even when there is no internet connection). You may be concerned about the privacy and security of your data as it’s online (“in the cloud”) and outside your own control. Web-based programs are often slower, have fewer features, and are generally less pleasant to use than the equivalent “local” program would be. A ToodleDo Screen - click on image to enlarge it. It’s free (there’s a “Pro” version available that has an annual subscription fee). You can create tasks/reminders just by sending an email to a special email address linked to your account. This is useful for creating tasks as soon as you think of them, but it also means you can forward an incoming email to this special address so that it’s on your “to do” list. There’s a data backup/restore feature (but not, as far as I know, a method for working “offline”). 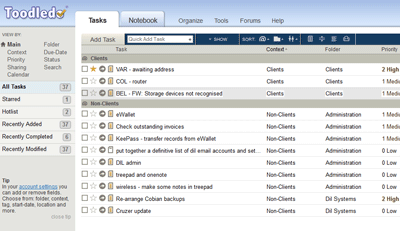 So, whether or not you use more than one computer, if you are looking for a Task Manager I recommend looking at ToodleDo. And if you are thinking you may want to be using a mobile device such as a smartphone or tablet in the future then I would definitely recommend bearing that fact in mind when choosing any new program or way of working.